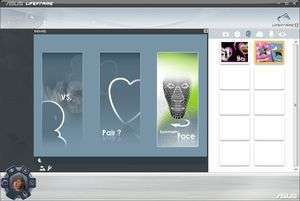 ASUS Lifeframe is a software utility that comes pre-installed on many ASUS systems, primarily laptops because they come with a built-in webcam. The software package allows you to do many image (still or video) capture, editing, effect, and publication capabilities. ASUS Life Frame provides user to operate camcorder, monitor, game, voice recorder, camera and preview recreational functions by built-in camera and microphone modules. For security reasons, you should also check out the ASUS LifeFrame download at LO4D.com which includes virus and malware tests. Additional screenshots of this application download may be available, too.